The UK provides a case study for how tough antismuggling measures, as enshrined in the Illicit Trade Protocol, can enable governments to raise taxes, increase revenues and discourage smoking. This wasn’t always the case. During the 1990s the government started increasing taxes above inflation to reduce affordability. By the beginning of the 21st century over 20 per cent of cigarettes smoked in the UK were smuggled, up from 5 per cent in the early 1990s. Worse still the illicit market share was predicted to grow to a third of the market within a couple of years if no action was taken. And access to cheap tobacco meant that the tax policy, which should have discouraged smoking and increased government revenues, was failing on both counts. The tobacco industry lobbied hard, saying it was high taxes causing increased smuggling and the only solution was to cut taxes. But media investigations and parliamentary enquiries revealed that it was the industry itself that was fuelling the illicit trade. 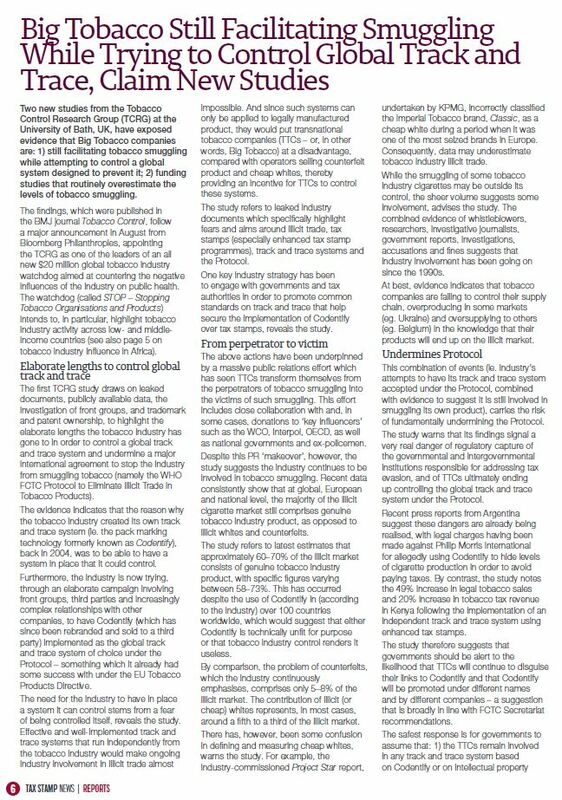 Tobacco transnationals were exporting cigarettes to countries where there was no end market, knowing they’d bounce back to the UK, cheap and untaxed. A good example is Andorra. From 1993 to 1997 sales of UK cigarettes to Andorra ballooned more than a hundredfold from 13 million to 1.5 billion. Andorra was importing enough cigarettes for every man, woman and child to smoke 140 a day. And it wasn’t just Andorra, British cigarettes were being exported to all sorts of places with no end market, including Latvia, Kaliningrad, Afghanistan and Moldova. The tobacco transnationals denied all knowledge, but as one Member of Parliament said to the Chief Executive of Imperial Tobacco, “One comes to the conclusion that you are either crooks or you are stupid, and you don’t look very stupid.” The UK Government held its nerve and continued to increase taxes, while implementing a tough anti-smuggling strategy, which included strict supply chain controls and financial sanctions very much along the lines of the Protocol. 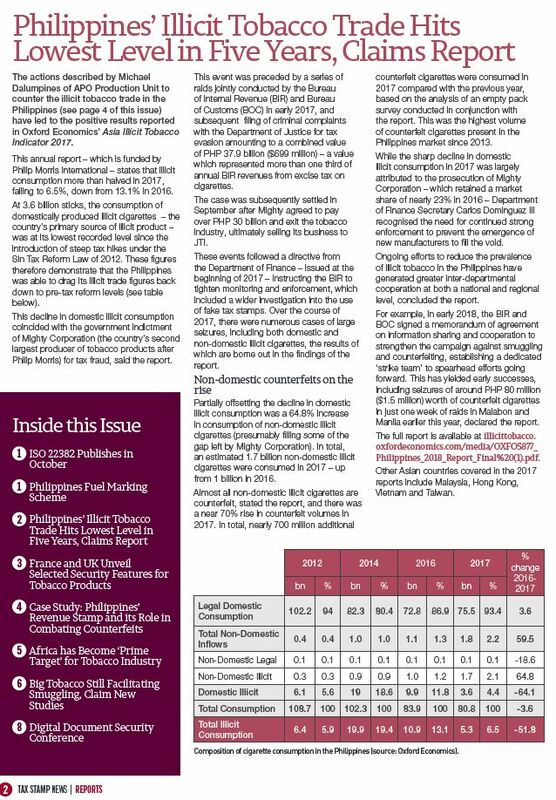 Between 2000 and 2016, the last year for which there are figures, the size of the illicit market for cigarettes fell by nearly 60 per cent from 17 to 7 billion sticks, with revenue losses down from US$3.67 billion to US$2.36 billion (at current exchange rates). Illicit trade is a major and growing global problem but the lesson from the UK is clear. The Illicit Trade Protocol can help countries raise taxes, increase revenues and drive down smoking prevalence. In Canada, in 2008 and 2010, the three major tobacco companies were convicted of contraband and entered civil settlements with federal and provincial governments. The convictions followed guilty pleas and resulted in fines of C$525 million, the largest in Canadian history. Civil payments totalled C$1.175 billion, with fines and civil payments together totalling C$1.7 billion (US$1.3 billion). These outcomes arose from actions in the 1990s when the three major tobacco companies in Canada exported vast quantities of Canadian made and branded cigarettes tax-exempt to the U.S., knowing that these cigarettes would return to Canada illegally as contraband. The result was that an estimated 25-30 per cent of the Canadian market in 1993 was contraband. At the time, the companies claimed that they were not doing anything illegal. The contraband situation prompted the federal government and 5 of 10 provincial governments in 1994 to reduce tobacco tax rates (the rates were not fully restored until 2002) . This had a serious adverse impact on smoking prevalence trends, especially among youth. Moreover, government tobacco tax revenue decreased substantially following the reduction in tax rates. Eventually there were criminal investigations, including Royal Canadian Mounted Police (RCMP) searches and document seizures at tobacco company offices. The three companies that were convicted and entered civil settlements were Imperial Tobacco Canada (British American Tobacco subsidiary); Rothmans, Benson & Hedges (Philip Morris International subsidiary); and JTI-Macdonald (now a Japan Tobacco International subsidiary, but previously, in the 1990s as RJR-Macdonald, an R.J. Reynolds subsidiary). Also, Northern Brands International, a U.S. subsidiary of R.J. Reynolds, was convicted in both Canadian and US courts. Governments recovered only a small percentage of the total revenue lost. In subsequent court filings, federal and provincial governments estimated that more than C$10 billion was forgone. Adding in the lower revenue following the tax rollback, the forgone revenue would be much, much higher. The Canadian experience shows not only the importance of high tobacco taxes and contraband prevention, but also demonstrates that the tobacco industry has engaged in illicit trade on a massive scale and cannot be trusted. All Parties to the Protocol to Eliminate Illicit Trade in Tobacco Products (ITP) will need to establish a national tracking and tracing (T&T) system. That system needs to be linked into a global T&T regime within the next 5 years. The system may be adapted to national requirements but needs to be able to monitor and verify the authenticity of manufactured or imported tobacco products in its territory. Clear global standards are yet to be agreed upon. What are the essential minimum requirements? Countries will want to purchase adequate and fully functional T&T systems. However, identifying a suitable vendor in the market may be tricky for health government officials who are unfamiliar with T&T vendors. Some systems have been developed by the tobacco industry itself and are incompatible with the ITP. Once the ITP is operational, it will involve the exchange of sensitive information. The confidentiality of any communication needs to be ensured. 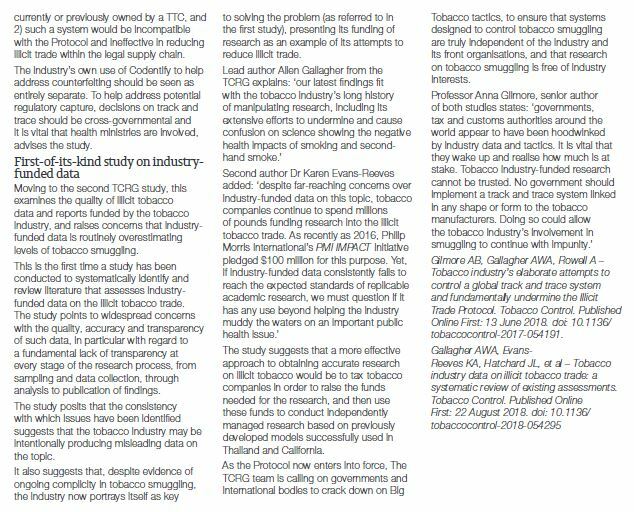 A secure system needs to be developed to protect it from the threat of criminal interests and the tobacco industry itself trying to corrupt and undermine the ITP.